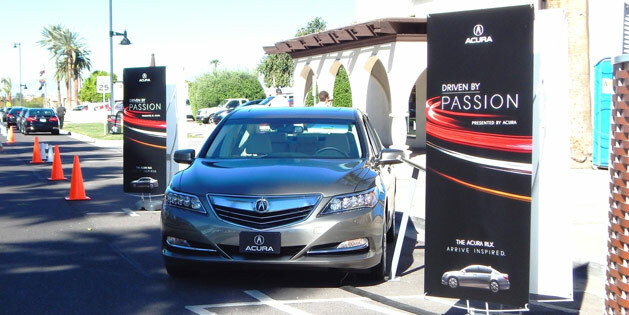 Acura has kicked off a multi-city cross-country tour called “Driven by Passion” to showcase the automaker’s new flagship luxury-performance sedan, the 2014 Acura RLX. The new experiential marketing campaign will occur alongside local cultural events in busy city-center locations while supporting local organizations and philanthropic causes along the way. The “Driven by Passion” tour is open to the public, and events in each designated city are intended to draw the attention of passersby. Guests in attendance will have access to Acura product specialists, receive information on Acura products and learn about the local and regional organizations supported in conjunction with the tour. Organizations supported by the “Driven by Passion” tour have been selected to reflect cultural passion points of each tour stop, embodying the luxury, prestige and excitement of the Acura brand. The all-new 2014 RLX is Acura’s flagship luxury sedan and features signature Acura technologies, including an all-new 310?horsepower i-VTEC® direct-injection V-6 engine, Precision All-Wheel Steer™ (P?AWS), Jewel Eye™ LED headlights and the next generation of the AcuraLink® connected car system. On sale later this year, the Acura RLX Sport Hybrid SH-AWD luxury-performance sedan is the first vehicle to deploy Acura’s new 3?motor hybrid powertrain technology, delivering 377 total system horsepower. The Sport Hybrid system combines a highly efficient, direct-injected V-6 engine with an all-new, Acura-designed 7-speed dual clutch transmission (DCT) with built-in electric motor and an electrically powered variant of Acura’s highly regarded torque-vectoring Super Handling All-Wheel Drive™ (SH-AWD®). This advanced new hybrid powertrain delivers exhilarating driving performance with incredibly responsive power delivery, and precise, sure-footed handling performance. Supported by the instantaneous torque delivered by its high-output electric motors, the RLX Sport Hybrid delivers V-8 power and 4-cylinder fuel efficiency. I was bummed to miss the event here in Phoenix over the weekend of March 8-9. By the time the press release came out (yesterday) the event had already happened. Would have loved to attend!